All of us are well acquainted with the term white collar jobs, but very few of us known what the term green collar jobs means. Nowadays more and more people have become aware of the various serious issues which our planet is facing. In order for things to improve, various governments and NGOs are taking care to ensure that awareness is increased among the people and that there is consistent sustainable development so that our future generations are able to have a safe and happy life. 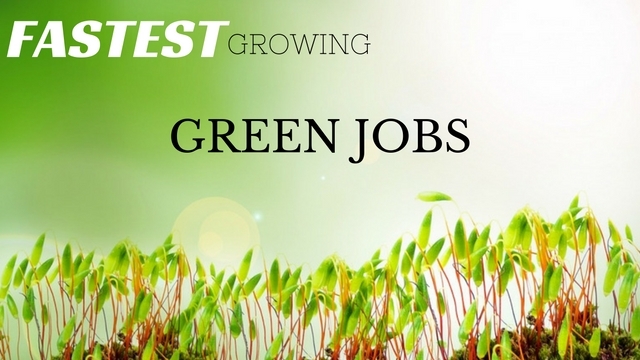 If you too are interested in getting a green job, then below mentioned are few environmental jobs or green jobs you can get in to. Previously, until even a few years ago, production was grown in rural areas and once the crops were ready they needed to be transported by road or by ship to the different parts of the country. This is something which has become increasingly expensive to do given the fact that the cost of both transporting and fuel has become so very high. Rather than spending so much money, there are urban growers now who manage fully functional gardens on the roof tops of even high rise buildings in urban locations. They not merely grow fruits but they also grow several vegetables. They ensure that all the techniques which they opt for are both environment friendly as well as safe. Air pollution is something which not only affects animals but also affects human beings a great deal. One of the major sources of air pollution is the emission which is given out by cars as well as various other modes of transportation. It is due to this that engineers across the globe have been trying for the last few years to come up with clean cars which will be environment friendly and wont negatively affect the life’s of those who inhale the emissions. Because of the desperate need of such clean cars, the need for clean car engineers has gone up as well in the recent past. Such professionals are paid good money for all the effort which they put into their work. Till a few years ago money was something which was considered above all else, however now this conception has changed, Water is now considered one of the most precious things on earth. Water is something which we cannot live without no matter how much we may try. This is simply because there are so many places across the globe which have run out of water. Water pollution is something which is a serious issue indeed and in the recent times, the governments and various nongovernmental organizations have really begun to wake up and take notice of the issue. It is due to this that the services of a water quality technician have become so vital and necessary to the world over. So do not hesitate to join this career if this is something which you think you can do. The job of a natural scientist is not an easy one at all. It requires a lot of effort and studies if you wish to make your way to the top of the line. Despite the effort which you need to make in order to be at the top, it is indeed a fast growing green job which has indeed advanced a lot in the recent past. If you are someone who is interested in the environment then chances are that you have heard a lot about this line. So rather than spending so much time thinking and over thinking about what you want to do, you should try your hand at being a natural scientist. It is a job which is very interesting indeed and involves a great deal of experimentation and observations as well. Across the globe people have understood the importance of separating their trash and categorizing it according to what can be re used and what cannot be re used. Once the trash has been collected the recyclable material is usually send to various plants where the material is further used in order to be made into something else. Being a recycler is not an easy job at all because it requires a lot of mental effort in order to come up with something ingenious as well as useful to be done with material. The green collar job of a recycler is something which is both well paying as well as fast growing. So if this sounds like something you would being interested in then, do try your hand at it. Being a builder is a job which pays well and is pretty popular. However over the last few years one of the fastest growing green collar job is that of a green builder. Previously houses and various buildings were only made by the use of things like cement and metallic objects. The entire process involved a lot of harm to the environment. The job of green builders has become so important and relevant nowadays because they make use of environmentally friendly things in order to make houses and buildings. These structures end up costing a lot less and they even last longer, without causing even a bit of harm to the world at large. Such initiates are truly revolutionary. When you are a teacher of environmental studies, you may not be directly involved in field work, but your job is certainly considered a green color job. Before action can be taken to protect the environmental or the planet which we live in, there needs to be teachers who are willing to impart wisdom to the future generations. The younger minds should be made sensitive to the needs of the environment because if they are unwilling to look into the needs of the planet then global warming and its effects are going to become even more extreme in the time to come. That is why the job of teaching about the environment, is certainly becoming the fastest growing vital jobs around. To work and have a green collar job it is vital to have a passion for the environment. If you are into truly concerned about the environment then you will never flourish in this line. One of the fastest growing jobs nowadays is a conservation biologist. So if you are confused about how to go about becoming a conservation biologist then you ought to search online for some information. If there is no scope for this job in your current location then you should be willing to move to another location as well. Conservation of the ecosystem and biodiversity is something which is a relevant topic indeed nowadays. Nowadays there are many companies across the globe which are looking to tap solar energy. Given the fact that the sun’s rays is so powerful and carries with it so much potential. Solar energy is something which comes directly from the sun and that is why harnessing this form of energy is a very good and intelligent idea indeed. For this very reason the services and knowledge of solar cell technicians are much in demand nowadays. Companies are eagerly waiting with arms wide open to employ people who they think would be capable of coming up with top quality ideas which can be executed without much difficulty at all. These jobs are very high paying and promising as well. As it has been mentioned above the services and expertise of green builders are much sought after nowadays. But along with the need for green builders there is also a great need for green design professionals as well. Such individuals work hand in hand with the green builders to ensure that the place they are deigning looks good and is built well also. The job of a green design professional is to give plans of how the finished product is going to look like. Such an individual has to be both good in art as well as explaining his ideas in a comprehensive manner. If he isn’t good in what he does the execution of the project cannot be up to the mark. Primarily speaking there are two kinds of energy sources, renewable energy sources as well as non renewable energy sources. Renewable energy sources are those which can be replenished by nature and do not run the risk of being used up. However on the other end of the spectrum there are non renewable sources of energy like coal and petroleum which are going to get over rather soon, if many continues to use up the resources at such a fast rate. Wind environment or wind power is a renewable source of energy which in recent times is being tapped a great deal in order to produce electricity. Since this is certainly an upcoming line, it is for this reason that wind energy jobs are also fast growing. Fuel is conventionally received from the burning of coal, petroleum or gas. Though this is the way things have been done for years on end, nowadays however environmentalists are thinking of alternative fuels which can be used instead of the regular fuel which causes so much of problems to the environment. Bio fuel is that fuel which is received directly from the living matter and since it is so harmless to the environment, scientists and engineers are working round the clock in order to improve both the fuel as well as the engines of the transportation. This upcoming line also offers a lot of fast growing. Along with being fast growing the jobs are also incredibly well paying. The surface of the earth is covered with 70% of water though not all of this water is suitable for consumption that does not mean that the water cannot be put to some good use for people in the world. Whether it is to produce electricity, work turbines or even run pumps wave energy is something which is being tapped in the recent past. 10 years ago the job of wave energy producers was something which was unheard of. However nowadays this has become a job which is growing at a very fast rate. People across the globe have recognized what a very promising career this is and that is why they are more enthusiastic about this line. One of the most popular and fast growing green collar jobs across the globe is the jobs which are being offered at various nongovernmental organizations. These nongovernmental organizations are doing excellent work in different parts of the world and they do not merely limit themselves to spreading awareness. They go beyond that and also have a very hands on approach. Working in a nongovernmental organization does not mean that you will not be paid. These jobs are paid very well and the employees are extremely happy doing what they do. They are glad because they don’t just work but also make a difference. From many years, people wish to get a white collar job which is both respectable as well as high paying. However green jobs have become just as popular now and more and more people are opting for this line. This field is not merely lucrative now but it also holds incredible promise for the future as well. If you want to enter this line, all you need to do is have a passion for the environment and the ability to think in an unconventional manner. Everything about these green jobs is more or less new so you must be willing to be a forerunner. As long as you work hard, you are bound to rise from strength to strength.